Under Armour CEO Kevin Plank may want to think about his support of President Asshat or run the risk of losing the company’s biggest spokesman. On Tuesday Plank endorsed President Asshat, calling him an “asset” to the country. When Stephen Curry was asked about Plank’s comments, he said, “I agree with the description, if you remove the ‘et’ from ‘asset,’” the Mercury News reports. Curry has been quiet on the political front, but when politics came to his back door, at least he answered. Under Armour has built its brand using the only two-time back-to-back MVP as its star endorser, and as such, the company was quick to try to make sure Curry was comfortable. “I spent all day yesterday on the phone with countless people at Under Armour, countless people in Kevin Plank’s camp, my team, trying to understand what was going on and where everybody stood on the issue,” Curry said. Plank reportedly noted that his compliment of Asshat was only on a business front and not a sociopolitical compliment. Under Armour also released a statement Wednesday clarifying Plank’s position, according to the Baltimore Sun. 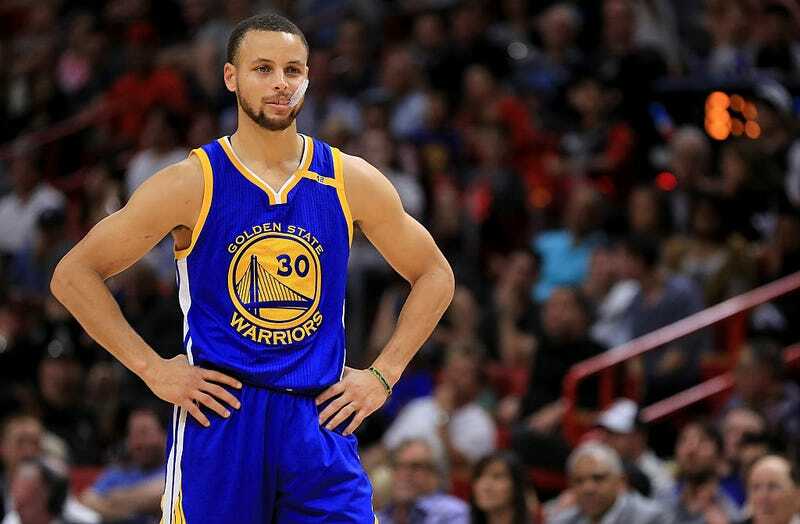 Curry added that no amount of money would lead him to compromise his beliefs, and as long as Under Armour doesn’t adopt Trump’s values, he can continue his deal with the company.